It's late. I was tired, hungry and lost in Eagle Rock. Blue Hen was inexplicably closed on a Tuesday night. 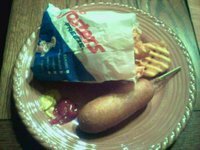 But Fosters Freeze was open, with its deep fryer ready to cook my corn dog and waffle fries. The chocolate shake was refreshing slush. 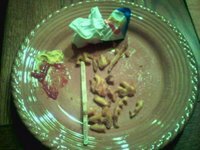 To prevent myself from turning into total white trash, I arranged the food on a pretty plate. 0 Response to "Fosters Freeze"